Steven Klein, Producer of Make Believe, introduces the film and discusses the making of the documentary. The American Documentary Showcase sponsored by the U.S. Consulate General and U.S. Embassy to Thailand features award winning films from American directors and producers and the quality of documentaries on offer was apparent with the short film on sustainable ranching and the opening film titled Make Believe. The packed audience enjoyed the first short, which featured ranchers performing sustainable ranching practices in New Mexico, Texas and Colorado. The wide open spaces of Texas and magnificent scenery of the Rockies kept the largely Thai crowd just as enthralled as seeing real life cowboys live a lifestyle so familiar and yet so different from Thailand. Melinda Levin answers questions from the audience about her short documentary. Director Melinda Levin, CINE: Winner of Golden Eagle Award 2011 for this short film, noted that at a showing in Khon Kaen one of the film students told her that while the scenery and background was so different, the lifestyle and beliefs were very reminiscent to her of rural life in Thailand. Melinda took questions at the end and noted that persuading the conservative ranchers to switch to sustainable ranching generally required showing that the practices were in fact, original practices by ranchers a hundred years ago and so that by making the change they were actually reverting to traditional practices. The longer film was an excellent documentary following 6 young magicians attending the World Seminar of Magic’s teen competition. The lives of the kids was played out and the skill of the filmmakers showed as the audience grew to care about how their lives turned out. I won’t spoil the ending since this really is a very good film that you should make an effort to find and watch. Vice Consul Paul Neville (far left) is joined by the Cultural Attache to the U.S. Embassy Michael Honnold (center) and his family at the opening of the American Documentary Showcase on Saturday, November 12, 2011. Directed by J. Clay Tweel and produced by Steven Klein, Make Believe won best feature documentary at the L.A. Film Awards this year. Steven Klein attended the screening at the CMU Art Museum theater and discussed the film with the audience afterward. The quality of films on offer this past weekend was excellent and considering that next weekend’s film If a Tree Falls, winner of Documentary Editing Award 2011 at Sundance Film Festival, explores the notorious environmental group the Earth Liberation Front, those interested should make time in their busy schedules to come and watch. The films start at 7 p.m. on November 19 and 20. Three Sisters; a contemporary Japanese interpretation. The Three Sisters will be performed at the CMU Art Center this Saturday, November 5, 2011. A long-awaited stage appearance from Japan’s internationally renowned contemporary dance theatre company Pappa Tarahumara will finally be realized at CMU Arts Center on 5 November 2011. The event is presented by Pappa Tarahumara in collaboration with Tokyo Metropolitan Government, Japan Foundation Bangkok and CNX Art Connex. Directed and choreographed by the troupe’s Artistic Director Hiroshi Koike, Pappa Tarahumara will present Three Sisters, an adaptation from Anton Chekhov’s timeless literary classic. In the new context of the Japanese countryside in the 1960s, it’s seemingly sweet portrayal of three bored sisters grappling with womanhood spirals into a sensual and charged meditation on female identity, coming-of-age and the Japanese obsession with youth culture. This eccentric comic tragedy, narrated through a dynamic choreography, is a powerfully condensed alternative to the company’s larger-scale multi-disciplinary works. 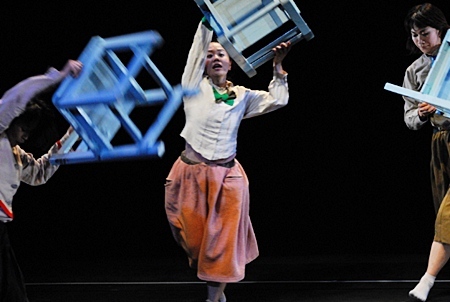 Since its premiere in 2005, Three Sisters has been performed over 100 times in more than 30 countries, including at New York’s Joyce Theatre, Singapore’s Esplanade, Guangdong Modern Dance Festival, and has won rave reviews across the world. Founded by director Hiroshi Koike in 1982, Pappa Tarahumara is distinctive and extraordinary from other theater companies for their original creative methods which the body, time, and space are blended to create real-time ephemeral performing arts. Without taking consideration of classifying their performance into any specific genres of theater arts, they rather combine contemporary dance, play, music and visual arts in their creative process, presenting a wholesome theater art. Therefore, the troupe has attracted many audiences worldwide and has attained an international recognition.